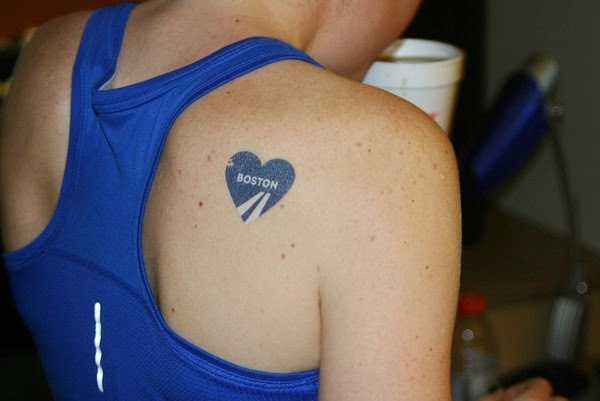 This year’s Boston Marathon was about redemption. After the horrors of last year, the runners and spectators were back to honor the victims, salute the heroes, and own the finish line. On a smaller, much less important scale, it was an opportunity for personal redemption. Last year’s race didn’t go well for me, but that was the least important thing in the aftermath of the day’s events. I thought I would have an opportunity to make up for my lackluster results that fall, but dealt with an injury instead. I wanted 2014 to make up for the entirety of 2013: everything would go smoothly and safely and PRs would abound. Including mine. Because of the injury, the preparation for this year’s race was shorter than usual. Around the time I normally would be ramping up to marathon mileage, I was still getting used to just running again. I adjusted my expectations for the build up: the training block would be a few weeks shorter, my peak mileage would be a little lower, but if everything went well, maybe—just maybe—I wouldn't have to lower my expectations for the race. All the major workouts were still there. And as I began checking them off, it seemed like everything was coming together. My long runs were faster than ever, even without consciously pushing the pace. I hit quicker paces in my marathon pace runs, and, importantly, I managed to finish the last one, which had been a discouraging disaster last year. With two weeks to go, I nabbed a mile PR in my favorite pre-race track workout. Of course, it wasn’t all blue skies and tailwinds. There are always bad days. (Remember all that snow?) I continued to struggle with tempo runs and my half marathon tune-up race was not what I had hoped for. During the tenuous taper weeks, my hip unexpectedly tightened. But I managed to brush off all of these negatives. I’ve never been good at tempo runs; why should that hold me back more this year than any other? The half marathon was a PR, despite being by a much smaller margin than I had wanted. And I became incredibly thankful the taper started when it did. If I had piled on just a little bit more, my hip might have staged a full-blown revolt. I seemed to have managed it just right, riding the perfect, fragile line between over-training and under-training. Tatted up and ready to go. Marathon morning arrived. As I was waiting around in the starting corral, an official nearby marveled at the gorgeous day, before a couple runners cut him off. “Too hot for running,” they snapped back. Their comment snapped me to attention. It was getting a little warm for marathoning. A perfect day for spectators (and don’t we owe it to them? ), not a cloud in the clear blue sky. But before the 10 am start, I had already stripped off all my sweats and was perfectly comfortable in skimpy shorts and a tank top, which is not okay for the beginning of a marathon. (On the best weather days, you are cold at the start, wishing you could keep your sweats on.) Still, I didn’t dwell on it. I was still confident it would be a perfect day. No one else seemed to be complaining about the weather. This wasn’t Chicago Marathon hot. The gun sounded, cheers erupted, and we were off. 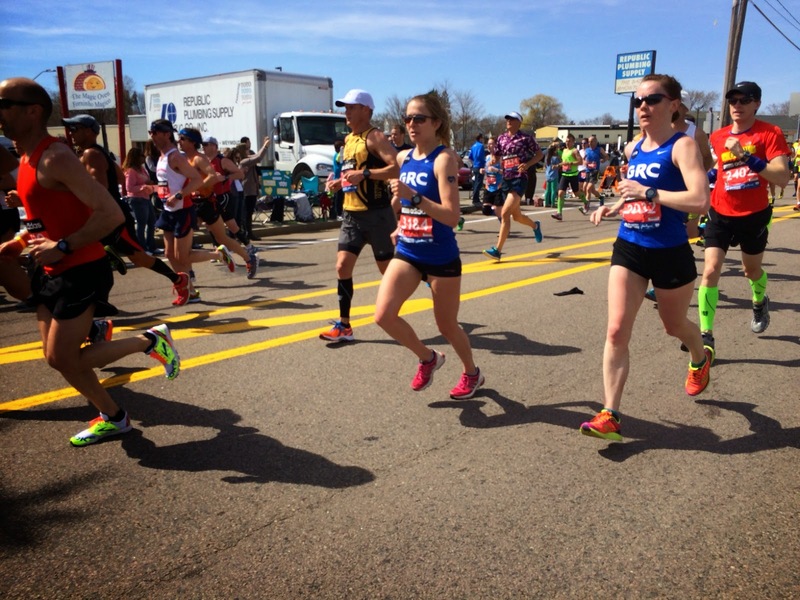 K and I planned to stick together for as long as possible, slowly inching our way through the massive crowds, down the first drop of the course, and onwards to Boston. As usual, the first few miles felt fine. A hair fast here or there, but nothing majorly off pace. My hip seemed fine, the crowds and signage were better than ever. I saw my family in Framingham (10k) and was all smiles. Still side-by-side with K, we were right on target. Around mile 9 or 10, I fell slightly back from K. The negative thoughts started creeping in despite my actively trying to bat them back. I was a little warm, and I noticed signs for sponges to wipe off your face and neck. But each time I came to a sponge station, they were all gone. There were more than thirty thousand people behind me, how had they run out already? They must have been for the elites. Damn those elites and their spoiled faces and necks. I dumped water on my head instead, but the relief was barely temporary. I hit halfway thirty seconds over my target pace of sub-2:48. Despite slowing down, I wasn’t too far off. I just needed to get back in a consistent rhythm. But I struggled to do so and by mile 15 the slowing down turned drastic. I was completely falling apart. It dawned on me—shockingly and awfully—this was a mile-for-mile rerun of last year. I had run well through the half, and now I was coming to pieces. And the hills hadn’t started. If I was already coming undone, there was no hope to recover while heading upward. Once the hills started, I would have them to blame for my demise. But I couldn’t figure out why I was already sapped. I could feel the makings of some gnarly blisters on my feet, but despite the sheer disgust and inability to wear shoes they would later cause, they weren’t slowing me down. My hip felt a bit tight at times, but nothing near full-blown injury levels. It possibly even felt better than during the taper. 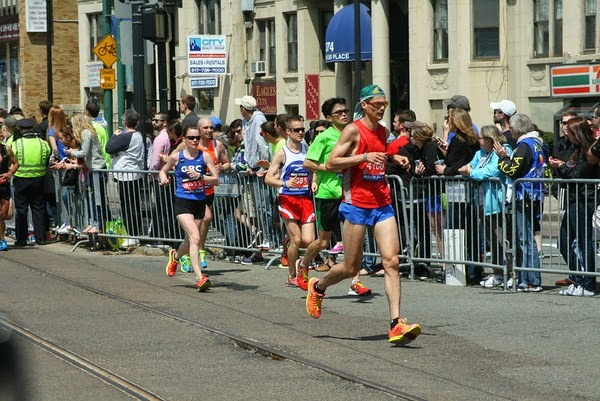 The course hadn’t yet gotten hard and the most injured parts of my body weren’t actively impeding me, what was? Had I gone out too fast like last year? Going into the race I had felt sure I could handle the pace. More than anything, my marathon pace runs told me that. Last year I did not have those workouts to back up my pace goals but stubbornly went after them anyway. It backfired. Was I stubbornly clinging to overly optimistic goals again? Falling apart in the same place, I began berating myself. I did not have a 2:48 in me today, again. Will I ever? I just kept thinking, “This is really hard.” (Better vocabulary was lost on me; this was just too damn hard.) Had I lost some toughness? Shouldn’t last year’s events, my poor race, and my injury make me tougher? I hadn’t run a good marathon in two years, would I ever again? My 2:48 was out the window, quickly followed by my plan B of sub-2:50. Even hopes of a PR soon became out of the question. As I ran up the hills, doubting everything I thought about my running ability, losing any glimmer of a way to salvage the day, I wanted to drop out. This was a slow exhausting march to a disappointing finish. Make it end. Two things kept me going. One was the fact that this was Boston 2014. The president had told us, “We finish the race.” Dammit Obama, I’ll finish the @#%$ing race. I wanted to run down Boylston, I wanted to hear those cheers. I wanted to show thanks to all the spectators, volunteers, and the city of Boston for supporting us, this year and every single year. I would finish. The second reason was much less globally impactful, more selfish, and honestly pretty silly. I wanted a water bottle. A full one. Around mile 19, my hands started tingling and I realized I was really thirsty. I can’t ever remember a time I was so thirsty in a race. (The 80 degree 2010 Chicago is a contender, but I have effectively repressed that memory.) I usually have to force myself to drink, taking Gatorade at every other water stop. This time I was begging for a new water stop as soon as I was through the last one. I even missed some: assuming they would continue to be on both sides of the road, as they were for most of the race, I had tried to go to the less popular left-side stop, only to realize—twice!—there wasn’t one there. Those two errors seemed like the biggest mistakes of my life. I didn’t drop out because I knew if I did, I wouldn’t have anything to drink. If I made it to the finish, they would give me a whole glorious bottle, and I would chug that thing. And so I kept running, counting down to the water stops, jogging along at my everyday pace, unable to do anything about it. I was in danger of not running sub-three, which seemed completely ridiculous given my hopes for the day. Still, I wasn’t actively able to pick it up. Mile 22. I run for water. With a mile to go, I knew I would at least run sub-3, but it offered no comfort. As I turned onto Boylston, the crowd roaring, I was glad I had listened to the president’s orders. I did my best to cherish the moment, soaking in the redemptive spirit of this year’s race. I would soon hear that Meb had sprinted down this same stretch in first place, the first American to win Boston in my lifetime, a wonderfully appropriate way to top off a celebratory day in a city that deserved it. But as for me, I had no sprint, no way to will my legs to a good finish in front of a great crowd. My personal redemption would not come today. As soon as I finished, the water bottle search began. But first, they gave me a medal, and then the space blanket, and I had to keep limping along down the road. I thought about asking a medical person for water, but realized quickly that medical people had more serious things to tend to. Finally—finally!—I was given a water bottle. I feebly asked for another, and the wonderfully kind volunteer gave it to me. Pressing my luck, I took yet another and chugged all three. Still not completely sated but feeling like I had completed my mission, I limped through the rest of the lines of food to the family meeting area where I met my husband and family. I didn’t have to explain my tears—they knew and understood my disappointment completely. They too thought I was ready for something big. Looking back on the day—with my scientist’s analytical eyes—the most plausible explanation for my meltdown seems to be dehydration. The thirst of the later miles indicates that; once you feel that thirsty, it’s too late. The day had been a bit warmer than I anticipated or was ready for, and the combination of three hours of relentless sun sapped me (as well as burned me). Others seemed to have a similar story; they went out well but then fell apart, inexplicably, just past halfway. But as I offered this explanation, some have brushed it off. There are a lot of variables in a marathon, and you can’t knock it out of the park every time. Sometimes you have a bad day, for no logical or scientific reason. You have to accept that you cannot PR every time. (I had PRed 9 of 10 times, but now regrettably have to add another blemish to that record.) I refuse to fully accept the “just a bad day” explanation. Yes, I know deep down that unexplained bad days happen. But it’s hard to think that way. When training for a marathon you have to believe hard work earns you a way to defy bad luck. You have to think it will be a “knock it out of the park” day. Which makes it very hard to accept when it is not. For two grueling hours during the race, my thoughts had been a continuous cycle of: “This is really hard. I want water. Will I ever be able to run the times I want?” (And more nonsense about the water.) After I finally had my fill of water, hours and days later, the other two thoughts persisted, nagging me. They cannot be satiated. I know that I will, or that I will at least try, because I'm a marathoner, and I’m stubborn, and that's what stubborn marathoners do. But crap, it's going to be really damn hard. 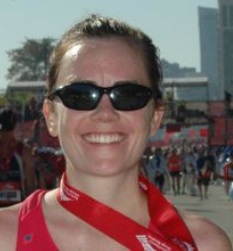 I am not a marathon runner, but your blog always inspires me. For example: "Sometimes you have a bad day, for no logical or scientific reason. You have to accept that you cannot PR every time." Thank you!!! You will get there, Teal!! I think we all have similar thoughts during a challenging (and not-going-as-planned) race. (well, maybe minus the constant thoughts about water!!) One of my favorite sayings about marathoning and getting better is: "It doesn't get easier - you just get faster" I like that because every time I go run a marathon, no matter how many miles of training I put in, it's HARD. To really RACE and run to your best for that day is just plain HARD. :) No matter if you are an elite or a novice, it's still so very difficult. :) Hang in there! Thanks for the great (and honest) recap - and congrats on finishing and running sub-3!! !